San Francisco: Amid the vast seas of compact vehicles vying for your attention, it’s easy to lose sight of the worthy Suzuki Aerio. Built like a minivan but more like a tall station wagon, it offers superb value and amenities. I’m convinced that if more people knew the Aerio existed, many more of the little cars would be cruising American roads. It’s easy to miss the Aerio in the showroom now, with the influx of new Korean-built siblings, including the Forenza, Verona, and Reno. But the Aerio is all-Suzuki, assembled in Kosai, Japan, and it goes its own way. You can get it as a tall four-door sedan or an equally tall five-door SX (Suzuki says this stands for sports-crossover, but you decide). The sedan comes as the basic S model or the more feature-packed LX. The SX is sold at one content level, only high, but it like the LX, can be had with all-wheel-drive. Suzuki’s QuadGrip all-wheel-drive system works like an AWD system should. Normally, power goes to the front, but if the system detects wheel slippage, as much as 50% of the engine’s torque can be automatically shifted to the rear axle. It requires no driver intervention, and is really meant to increase on-road safety rather than to make the Aerio an off-roader. Suzuki has the Grand Vitara and XL-7 to take care of those duties. The Aerio compares favorably with mass-market competitors like the Honda Civic, Toyota Corolla, and Toyota Matrix under the hood and under the roof. Its 2.3-liter dual-overhead-cam inline four-cylinder engine puts out 155 horsepower and significantly, 152 lb.-ft. of torque, which beats the standard engines in the aforementioned rivals by a goodly margin. Torque peaks at just 3,000 rpm, so you don’t have to wind the car out to get good use out of the engine. The standard transmission in front-wheel-drive models is a five-speed manual, with a four-speed automatic available as an option. AWD Aerios come only with the automatic. Fuel mileage is the same with either Transmission, 25 city, 31 highway pretty good for a 2,700-pound car. All-wheel-drive models earn slightly diminished ratings of 24 city and 29 highway. Front and rear headroom in the Aerio beats the three named competitors. The higher seating position provides a little of the expansive feeling and panoramic view that you expect from an SUV. Body dimensions are compact, though, for easy parking and maneuvering in town. My Techno Blue Metallic sample driver was the SX all-wheel-drive model. This shade made the somewhat box-shaped vehicle look sporty sitting still or in motion. Standard 15-inch alloy wheels help it avoid the impression of an econobox. The lines are solid and chunky, with creased bulges over the wheel wells to help convey motion. The look has been upgraded for 2005 with a new chrome grille, fog lamps, and front bumper. The tail lamps of the SX model resemble the custom kind favored by young customizers. The interior boasts numerous stylish enhancements. Inside, every Aerio gets a generous equipment list, even the basic S model. It includes stuff like power windows, locks and mirrors, tilt wheel, intermittent wipers, and even a seven-speaker AM/FM/CD system with tweeters on the dash and a subwoofer thumping away under the drivers seat. All Aerios receive automatic climate control, which is unexpected in a non-luxury vehicle. The up level LX sedan and SX also get keyless entry, cruise control, a six-disc CD changer, heated outside mirrors, and more. The interior is always black in an Aerio, regardless of model or equipment level. Making things a little less somber are matte metallic-style accents on the doors, console and corner vents, and cloth seats that flaunt a vibrant pattern. A leather-wrapped steering wheel and shift knob impart just a hint of upscale. Somehow, all the pieces work together to make the inside of the Aerio an inviting and high-quality place. Previous models have earned top safety ratings from the Insurance Institute for Highway Safety and the National Highway Traffic Safety Administration. With an energy-absorbing structure, standard front seat-mounted side airbags, and seatbelt pretensioners, the Aerio is one place you’d rather be if a crash is inevitable. 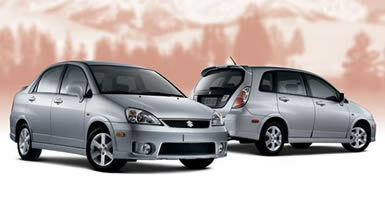 The Aerio’s seven-year, 100,000-mile warranty is completely transferable to succeeding owners. You also get a 36,000 mile / three year new-vehicle limited warranty and three-year Roadside Assistance Program. My tester, with only one option, antilock brakes ($500), came to $18,294, including destination charges. You can pick up the basic S sedan starting at just under $14,000.